This page provides you with Android Developer resume samples that you can use for inspiration in writing your own resume, or for creating one through our easy-to-use resume builder. Below you'll find our how-to section that will guide you through each section of a Android developer resume. There’s never been a better time to be involved in Android development - its brand is on the steady rise as it continues to develop new technologies. But with that comes fierce competition, all pitching to the same job roles. Coding is not easy, but writing a standout Android developer resume is not simple either. If you are looking for the essential key to unlocking your future career success, our android developer samples will inspire you to reach new heights and stand out from the masses. We have helped over 3 million people around the globe to get the dream job they have always been looking for: now, it's your time! When you’ve only got 6 seconds of review time, you need to make it all count, especially when working on an impeccable resume for an experienced Android developer. Most importantly, we highly recommend you emphasise your key achievements to really highlight your career growth: a reverse-chronological format will allow you to do that. 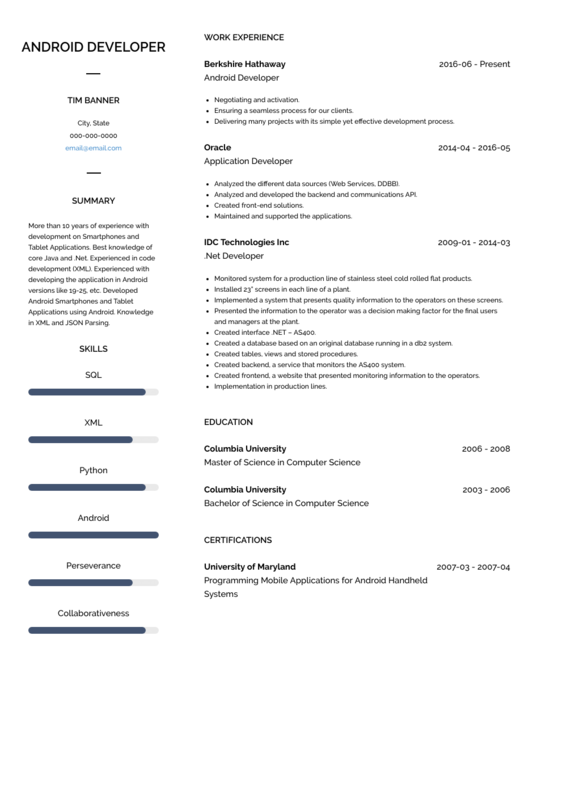 When crafting your android developer resume, use easy to read font, combined with big headings and a substantial amount of white space. On the export, make sure it’s done with PDF rather than Microsoft Word, as the final result will look clear and digitally intact. This is where your sell becomes most important. For the highly-experienced, showcase your biggest achievements with statistics and figures in the summary section. Experience in designing, developing and testing Android applications should be quantified, as well as key breakthroughs in troubleshooting new equipment. Innovative and professional Android Developer with 10+ years experience core designing, testing and maintaining key mobile applications. Proven 20% decrease in app down time in testing phase consistently over 5 year period, leading to improved user experience. Seeking to co-lead specialised training programs into new program innovation, leveraging high-end use of Java to improve equipment. Motivated Android Developer with years experience making applications wants to work at your company. Well-versed in troubleshooting procedures and developing new softwares. Our resume builder can give you tips and examples that will inspire you to create your perfect android developer resume. Check out our easy online CV Builder now! If you’re a junior level android developer, or fresh out of university, use this section as an objective statement to highlight any transferable experience. Emphasising that you’re also goal-driven and motivated to progress in the industry will help catch the recruiter’s attention. Driven and professional junior android developer with proven knowledge of testing native applications like UI whilst troubleshooting user experience issues and functionality problems. Undertook 3-month industry placement at Diamond Tech, assisting 5+ agile mobile developers in designing new cycling app. Seeking to leverage industry experience to work at X company. Entry-level android developer with experience testing applications wants to gain employment at your company. Did a 3 month placement at Diamond Tech, helping developers with coding tasks. This is where you really get to lay on the details, especially if you’re a niche senior android developer with a substantial amount of notches in your belt. Whether you’re an experienced core features developer highly-skilled in Java, are you just starting to assist in writing code, this section can really light up. Have you increased your client’s app usage by 50% in the last year because of improved back-end design and development? Have you launched an android application that’s got a ⅘ star rating in Google Play? It’s all worth a mention. You can start by listing the company name, your position, followed by dates and key achievements and figures. It can be all too tempting to dive into detail - but remember not to overload this section and make it clear for potential HR consultants to pick up. Android Developer with no experience: We highly recommend taking some part-time or voluntary experience in the developer field to improve your resume. The assistant coding work you did for a friend’s start-up is highly valuable, like any knowledge of JAVA or C++ that you’ve acquired through practical or theoretical experience. Have a look at our detailed resume guide and find out more information on how to write your work experience section. Having a BA in Information Technology alone won’t qualify you to become an Android developer. Completing a MCS (Microsoft Certified Solutions Developer) will put you on the path, as will a Google Developer Certification, IBM Certification or GIAS. It goes without saying: this section must be entirely truthful. Gaps in employment history due to illness or career change must be made known. The industry you work in is so fast paced that keeping updated is a huge part of the job hunting process. An android developer’s technical skills are what potential recruiters really want to know about. Combine these with softer, interpersonal skills and you can really highlight your suitability for the position. Seal the deal in the hiring process with a cover letter! If you are looking for a cover letter for an Android Developer like you, you should check out our cover letter examples here. You have made it to this point, you have believed in our best examples for an Android Developer Resume and, therefore, we believe you deserve some extra tips! If you are looking for that extra special touch, we have the Android Developer resume templates you are looking for. Easy to use and professionally designed, our CV templates have helped many professionals like you conquer the world!